I live and breathe cloth diapers. Every day I do work related to promoting and educating others on the benefits of cloth diapers as well as how to use them. Most of my focus is channeled to the online world and I admittedly do less in my local arena than I should. I do know a thing or two about being an advocate and I want to share with YOU some advice and hard won lessons about being the best, and most effective, cloth diaper advocate you can be. Lesson 1: Know your stats and facts. When you have an opportunity to bring cloth diapers to a conversation you should be able to answer questions asked by interested parties such as “How many diapers does a baby use in a day/lifetime?” “How much money can using cloth diapers save me?” “Will my water/electricity bill go up and if so, by how much?” These are all very common questions and are usually asked so KNOW YOUR ANSWERS. Visit the RDA’s Real Diaper Facts sheet (there are also ways to print and share these) and learn a few facts that will help you. You might also read Kelly Wels’ book Changing Diapers, the Hip Mom’s Guide to Cloth Diapers for guides and easy to digest facts about cloth diapers. Lesson 2: Know your terminology but don’t overuse it. Fundamental particles(Not subatomic, as protons are subatomic and made of fundamental particles made of strings but not made of strings themselves) like quarks and electrons are not singular points of no size, but strings which may be open ended or closed looped. Your response: blank stare. Same goes for rattling off a paragraph about cloth diapers where you throw in accronyms and terminology that only a seasoned cloth diaperer would understand. A conversation about cloth diapers when you are trying to advocate for their use should use general terms. Let’s use an example. You are explaining modern cloth diapers and their advanced features compared the the older prefolds and flats. “Modern cloth diapers utilize a polyurethane laminate that is breathable and waterproof. The diaper can have absorbent soakers with microfiber inserts, bamboo, hemp, or cotton and these can either be stuffed into the shell, like a pocket diaper, or the layers are sewn down, like an All in One. Or they can be snapped in or laid into the diaper like an All in Two. Then there are some diapers that are not waterproof, like prefolds, fitteds, contours, and flats. Those would need a waterproof cover of PUL, TPU, Wool, or Fleece. Some diapers have a tongue style insert that is attached at one end or a sleeve style opening that allows it to function and dry like a pocket diaper but the insert agitates out so you never have to unstuff i. They have options to be closed with snaps or aplix and some have hip snaps to prevent wing droopage. Some are one size and adjust using a system of slotted leg elastic where the legs are tightened or rise snaps on a 3×3 grid and the rise is snapped over to accommodate a smaller baby and still get large enough for a toddler…..” and so on. Over simplistic? Absolutely. Leaving out many types of cloth diapers? Yep. But with time you, or the interested parent, can dive more in depth into the cloth diaper seas. Or they will simply choose a set of cloth diapers and use them without ever researching anything else. That is fine too. Leson 3: There are no stupid questions. We all have to start somewhere. None of us began cloth diapering as experts. The phenomenon of enveloping yourself into a world, in this case, the cloth diaper community, will make you forget that you once had no idea what a “Pocket Diaper” is. When a potential cloth diaper user asks a seemingly “ignorant” or “newb” question it is your responsibility to answer with humility and respect. Even if the question is “So you mean you don’t throw a cloth diaper away? You wash it and reuse it?” you simply answer with no judgement or sarcasm. Lesson 4: Don’t take an “all or nothing.” approach. I might lose some people on this one but the way I feel about advocacy for any cause is simple: don’t expect to win anyone over as a zealot who is preaching “all or nothing.” If you want to woo someone over to trying cloth diapers you have to expect that they might not have the desire or means to use cloth every minute of every day. In my mind getting people to use cloth some of the time is better than none (see Change3Things for an example of advocacy in small steps). If they choose ALL of the time then that is even better. Even just saying “You can begin at your own pace and start with a few diapers, only use diapers at home, etc…” can be enough to convince someone to try. The perception is that cloth diaper advocates are a shrewd group of militant mothers who would spit on the face of anyone who chooses to use a disposable diaper when on vacation or out of the home. Life is what it is and you have no idea where others are coming from. Your situation (SAHM, WAHM, WOHM, Single parent, rich, poor) differs from theirs. Your routine, your ideas, your plan, your advice is based on your own experience. Do the movement a favor: if you are on your high horse about cloth diapering please step down and advocate from an understanding point of view. Lesson 5: Be a Cloth Diaper Boy Scout: Always Prepared. My baby starts conversations wherever we go. Sometimes conversations start because he is wearing one of my “Cloth Diaper Advocacy” t-shirts. Other times he is riding in my ring sling and I get asked about the sling… then we start talking cloth diapers (I have no idea how that happens *wink*). For these encounters I keep my business cards (more for the the email in case they want to ask any questions), my App Download cards in case they want to scan the QR code and download my app for research, and I always have clean cloth diapers in my diaper bag for “show and tell” if they are really interested. Lesson 6: Be Real About Cloth Diapers. In the spirit of Real Diaper Week 2012 I hope everyone will consider being a compassionate and educated advocate for cloth diapers. Even just helping one mother switch to cloth diapers can save a potential 5,000 diapers from the landfill and that family up to $2,000! Go forth and advocate! This post is part of the Real Diaper Week BlogHop. 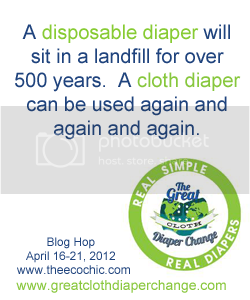 You can see the other entries by visiting The Eco Chic and read about more tanglible ways to advocate for cloth diapers in her great post. What is your personal cloth diaper advocacy philosophy? Leave a comment!